Home to the University of Idaho and less than 10 miles away from Washington University sits Moscow, Idaho. At its center, on Main Street in Friendship Square, the long established Moscow Farmers Market pops up every Saturday, May through October. This rural, northern Idaho city champions the market because it is at the heart of community and is a thriving, local economic driver. Over 20 brick-and- mortar businesses can be traced back to the market, their owners having first established themselves and their offerings as Moscow vendors. We couldn’t agree more. Moscow Farmers Market continues to grow (see below about the successes and challenges associated) and intertwine its populace. We’re thrilled to have them as our Guest Instagramming market for the next two weeks. Follow along with this 40 seasons strong market! 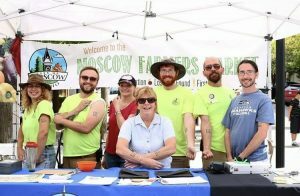 Zack Ellis: 2017 marks the 40th year of the Moscow Farmers Market! Our farmers market features between 120 and 140 vendors each season. We close Main Street every Saturday from May through October, and our vendors’ colorful booths fill the three block stretch in the heart of our community. Our mayor appoints a volunteer commission to create policies and direct long-term planning, then a handful of staff, an AmeriCorps coordinator, seasonal workers, and volunteers work to organize the vendors, live entertainment, and programming. Our market is first and foremost about our farmers. Farmers within 200 miles of Moscow are welcome to register for a space, and that 200 miles covers a wide range of agricultural biomes throughout parts of Idaho, Washington, Oregon, and Montana. Our vendors do not simply offer Idaho potatoes and Washington apples, but they provide a smorgasbord of locally grown produce ranging from rainbow chard, Armenian cucumbers, and fire-roasted peppers to strawberries, nectarines, and huckleberries. Our craft, value-added, and prepared foods vendors must pass a jury process to be accepted into our market. Their local honey and heirloom tomatoes would certainly be enough to make Moscow worth a visit, but one creamery’s “orchard blue” and “marinated labneh” cheeses also won first place at the 2016 American Cheese Society Awards! ZE: Nestled between the Nez Perce and Coeur d’Alene tribal lands, the rolling loess hills of the Palouse are home to people who defy the stereotypes of rural communities. Moscow prides itself on being the “Heart of the Arts,” and hosts events such as the “Lionel Hampton Jazz Festival” throughout the year. In our rural town of 23,800 people, our weekly farmers market gets 176,380 annual visits. The market runs from the beginning of May until the end of October, and the produce selection changes with the seasons. Visitors entering the market would see that three blocks of Main Street are converted to a bustling pedestrian mall. They are greeted by the smell of grilled chorizo burritos sourced from locally raised hogs, hamburgers fresh off the grill, and Indian-fusion cuisine made from scratch. As they walk closer, they see the sights of vendor canopies and colorful umbrellas over picnic tables. The sound of live music from buskers and the main stage fills the air. They pass an apple vendor enthusiastically passing out free samples, then they borrow a free courtesy wagon and begin shopping. Farmers greet them and are proud to describe their products. Craft vendors peddle hand carved cutting boards and welded metal statues. One local chef shows a crowd how to make her favorite recipe. A “speakers’ wall” is filled with passionate people raising awareness for causes ranging from political and religious issues to promoting their roller derby league. They see people from all walks of life who have come together to celebrate a festival of fresh local food. ZE: Being home to the University of Idaho and also being only 8 miles from Washington State University, another land-grant institution, we make an effort to give people from both universities opportunities to participate in our farmers market. We were the first market in Idaho to accept food stamps, and we accept WIC and Senior benefits from the State of Washington. Our “Chefs At The Market” program invites local chefs and restaurateurs to demonstrate their creative use of market produce in dishes like “Spiced Pecan Lentil Bruschetta with Arugula Pesto,” and our “High Five Passport Program” has been recognized for helping children learn to make healthy choices through its produce tastings and kids cooking demonstrations. The Moscow Farmers Market also has spaces for people and nonprofits to promote their causes to the 5,000+ weekly visitors. The USDA was a staple in this section while promoting the 2016 “Year of the Pulse” programs. We also host live bands twice per day featuring blues artists, folk musicians, jazz trombonists, and rock guitarists to give back to the patrons who make all of this possible. ZE: Word of mouth drives people to our market, both online and in our community. Vendors and staff work very hard to get delicious food and memorable experiences to our patrons (of whom, 35% are from out of town), who in turn have made the farmers market the premiere weekend activity in our region. We also post content to our 4,600 followers on Facebook throughout the week, including vendor updates, events, photos, and videos. We hang banners over several arterial roads, display posters in local storefronts, and place temporary signage around our downtown. Our staff discusses market events on local radio stations and sends out press releases for local newspapers each week. When we reach out to visitors throughout the week, the farmers market is fresh on their mind on Saturday morning. More importantly, many of these outlets give visitors information on contacting market organizers directly so we can answer any of their questions or concerns. 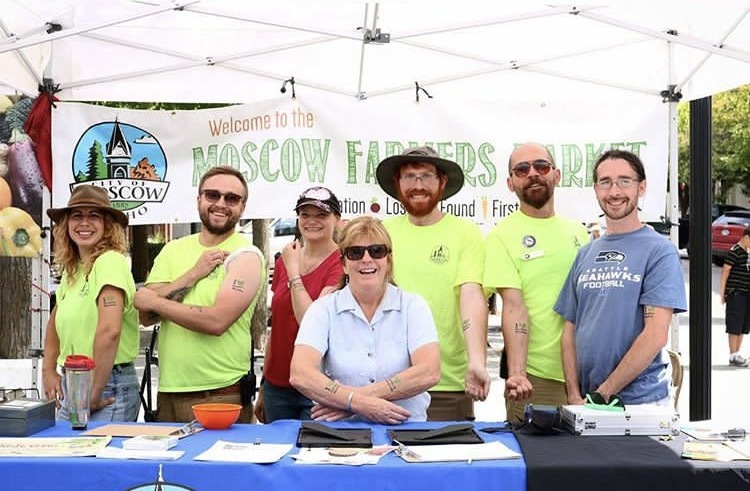 ZE: The Moscow Farmers Market has been ranked by the American Farmland Trust as one of the top 25 farmers markets in the nation for several consecutive years, but that distinction does not come without a few challenges. Our attendance has been steadily growing by 7% per year, which has put strain on our downtown infrastructure. In the past we had partnered with our police department and a downtown college to provide restrooms, but our City Council recently voted to fund permanent public restrooms to ease their burden. We also have been faced with a parking shortage, so we have been adding temporary handicapped van accessible parking and incentives for families who encourage healthy choices by walking or biking to the market. Because we close Main Street on Saturdays, some shops were concerned that growing the market might affect their revenue. A 2015 AmeriCorps survey then showed that 81.9% of downtown businesses showed increased or neutral income on market days. By being proactive and using facts to drive our decisions, we have been able to continue providing a positive experience for our attendees, vendors, and affected businesses. ZE: The Moscow Farmers Market is open from 8am until 1pm on Saturdays from May through October. See you there!